During The Election Of 2004, President George W. Bush and Senator John Kerry were asked numerous questions about their membership within ' The Skull And Bones Society ' - to which they both jokingly responded: " It's A Secret, I can't tell you anything more "; and from the grins on both of their faces, they considered this entire field of questioning to be quite humorous! Meanwhile, the most interesting question put forth was: " What is The Meaning Of 322, which is referenced in all of their organization's symbology ?" Actually, however, The Meaning Of 322 to the Illuminati is very simple for us to accurately ascertain. While all of The World's Secret Societies are based upon: Satanism, The Kabbala, and Luciferian Teachings - they have always been, strangely enough, drawn to The Bible as their own personal code book! In fact, their affinity for utilizing The Bible - in this way - is actually a seemingly hilarious, exceptionally clever, and closely held insider joke.... All the more so, since they can utilize Yahweh's Prophetical Book against His own children - in these particular spiritual matters. Know Your Enemy: " Skull And Bones " - The Vigilant Guardian.
" Then The Mighty One said, ' Behold, the man has become like one of Us, to know Good and Evil [ Possessing The Previously Hidden Knowledge - Upon Which It All Works ]. And now, lest he put out his hand and take also of The Tree Of Life, and eat, and live forever [ V22 ] - therefore Yahweh The Mighty One sent him out of The Garden Of Eden to till the ground from which he was taken. [ V23 ] " - Genesis 3:22-23. Do The Illuminati serve ' Satan ' [ or Lucifer ]? The answer is both: Yes and No. While they do in fact serve Lucifer, they do so only due to A Common Agenda. Ultimately, their intention is to overthrow him as well; by somehow pitting the two opposite forces against each other. After all, their underlying intention is only ' To Serve Themselves ' - just like Lucifer, their original role-model! This is at the very heart of Kabbala. Which, of course, brings up a highly important question: " Why were the verses of The Bible divided up in the midst of sentences, by whomever devised this particular system for studying it? " Doesn't that ever bug you, like it did for me? The answer, of course, is that This System Of Study was devised by The Illuminati themselves... and then cleverly foisted upon the public, as a more efficient means for studying The Scriptures. For some reason, this is currently The Most Read Article at America In Prophecy! And, by this point, my curiosity is frankly now killing me. For those who've enjoyed reading this article, I have one simple question: "How can so many people read this article, without leaving one single comment of any kind?" I think it is our common duty in the face of a common danger that imposes the destruction of our democracy to stand up as we the people against these forces which have entrenched themselves within our government. We must unite and take back our country before our traditions become history. I have booked a house with the number 322. But now I am confused whether it is an auspicious number or not. Please suggest soon. I am a born-again believer in Christ. I wouldn't actually worry about it Monica.... The Actual Number [ Itself ] Is Meaningless, to anyone other than The: Jesuits, Illuminati, Freemasons, Kabbalists, and All Other Satanists. I'm not saying that you should actually become Superstitious - about any particular numbers, or [ even ] numeric symbology. However, I am merely explaining ' The Truth ' about a very important spiritually discerned topic! Knowledge Is Power... and believe it, or not, your own Spiritual Enemies fully know this! It's not me,you or anybody who will preserve the Holy Quran it is Allah. The Holy Quran was Arabic to begin with while your Bible has been translated from other languages that have a very different meaning that what you currently read. Hint:learn one of the Semitic languages (Arabic Hebrew and Aramaic ),go read your bible, then talk. First of all, this particular article has absolutely nothing to do with: " The Holy Quran ". Secondly, The Majority Of These: Satanists, Freemasons, and Other [ self-described ] Illuminated Ones - aren't Muslims; and live in the [ so-called ] Christian West. Finally, it was actually those: " Illuminated Ones " - who themselves devised Our Current Scriptural Numbering System! So, regardless of any issues concerning The Scriptures own factual purity, Their Satanic Number Of 322 does [ in fact ] refer to Genesis Chapter 3 Verse 22. I enjoyed reading this article as I myself, have not been able to work out what 322 means. 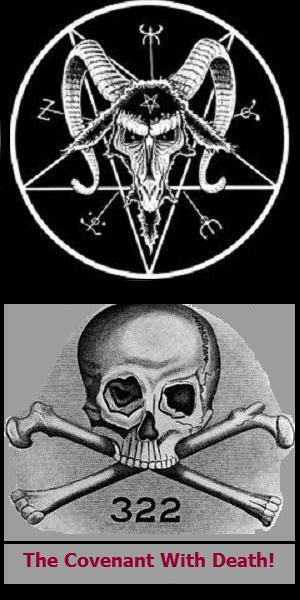 I know masons use the coffin, skull and bones symbol as well, so I know they're all connected.... I've even seen it for myself..... I had a theory that the illuminati may bring Biblical end time revelations forward and make them happen themselves so that when Christians go to the scriptures for answers and Jesus does not come back, it could cause them to abandon their beliefs altogether. It seems certainly possible as again, being like satan (I purposely will not capitalise 'satan'), they are the masters of deception. Real Christians will know the difference and will not abandon their faith in Jesus no matter what happens. These people cannot possible out-think or out-wit almighty God. The Lord knows all and sees all so therefore all they are doing is wasting their time. They may have their run on the Earth for as long as God allows them to. This will seperate the faithful from the unfaithful and it deeply upsets me to know this...so many people are easily swayed and and I thank God for the power of the Holy Spirit so we may see the world for that it really is and that we may remain stoutly resolute against the forces of darkness and evil in this world. Jesus will return and all who cry out the name of the Lord in their hearts and spirits will be saved. So to anyone who does read this, do not fear, do not be afraid. Your body may be destroyed but the peace you will have with God is everlasting and can not be undone by anything. In reference to the 'holy quran'...if we speak contextually, all muslims have actually been decieved whether they like it or not. I suggest they take a good look at the Bible and what Jesus said in the Gospel and then compare it to the quran... Considering that the muhammad confirmed the authority of the Bible and the Torah (both of which were thousands of years before it)...and then goes on to contradict itself by doing the exact opposite of the authority muhammad spoke of in the Holy Bible and Torah.....so connect the dots, it really isn't hard and then come to the truth, life and light that is Jesus Christ, he told you and everyone else on this planet THE TRUTH. satan has worked many forms of deception in the world and he still continues to do so today. Exposing the illuminati to the entire world has everything to do with people power and their willingness to hear the truth. The truth is often the most hard to accept. I applaud you for this blog and I will keep a watch for more. Thank you and God bless you always. Peace be with you, in Jesus name. "For our struggle is not against flesh and blood, but against the rulers, against the authorities, against the powers of this dark world and against the spiritual forces of evil in the heavenly realms." - Ephesians 6:12 NIV. "For we wrestle not against flesh and blood, but against principalities, against powers, against the rulers of the darkness of this world, against spiritual wickedness in high places." - Ephesians 6:12 KJV. I'm trying to figure things out..but it's not easy so I'm letting God lead my steps, and being very careful with what I find. The facts are, to the enlightened, the first cause of the Universe, the All, is unknowable. All the adepts, initiates and students know this is the Law. The reason is this, no thing apart from the All can contain the amount of Light (information) that would be necessary to comprehend this state of awareness. This is Satan's lie and is unbelievable that these supposed Masters of light could believe their own ignorance. For to know the All one must be reabsorbed, no longer a-part. So the Sons of Light were placed in the position of defending the Law, of which, the Fallen Ones claimed was a lie, that the individual beings could reign supreme over their territories, their star systems. The myths of Narcissus with the attendant jealousy, anger, ill will, lust, envy and greed are the expressed character emotions of the Fallen Ones their Hallmarks, while Love, Goodness, Compassion, Caring, Empathy are the traits of the Enlighten, the Sons of the One True God. One last point, the All is not a being, as the human mind personifies all images of the All hence the condition that "God" is a being in human form. The All is Force, Universal Light, and it moves at such an intense speed that all is contained within it. It is in you, you are in it, but as you are apart from the All you are not the all. See how Satan's trick is a losing hand? You cannot be destroyed, as energy cannot be depleted, it can only be transformed, so do not fall for the Fallen One's lie, but rest in peace knowing the all is in the All and no one being can ever claim to know the All, "Oh thee of little will, have faith"
As I layed don't on my bed,I dreamt that satan was organising something,his agent had a piece of metal written 322 and it was already open. I feared and when I woke up in made research and also came up with this. I also read on Julian calender before Gregor is calender. This calender is special than all. "Meanwhile, by dividing these scriptural references appropriately, they're able to utilize: " The Most Commonly Available Book On Earth " - as ' A Cryptographic Key ' - which no one could ever question their possession of! After all, if they're Satanists, then why would they own A Bible? Of course, as we all know, even Lucifer quoted The Scriptures! And now, you know ' The Truth ' behind: The Illuminati, Skull And Bones, and The Meaning Of 322...."
How do they use it as a key and for what purpose? As the Bible proclaims, in the end all evil and darkness will be destroyed. I do not need to understand everything about this process to completely believe its inevitability. One of the tricks in being decieved, is that the decieved does not percieve that they are decieved. Ah well, this also is of little import, since all who seek will find, whether they seek the True God or the false one, lucifer. If what some are saying are true the illuminati have ties not only to Satanism but to Reptilian Alians (ones from the sky) which may make the reference 322 more understandable as at that point in Genisis the reptile conquered man. Their time is short lived. Awaken mighty men of Christ. Know thy enemy. Well, I'm personally not so sure about: " Those Reptilian Aliens " - but, they are indeed metaphorically likened to serpents - so, I'll just give it pass. Thank you brother Francis for the explanation of Genesis 3:22. That makes a lot of sense to me. I needed to "Google" the meaning of 322, as I have experienced a very significant increase of seeing it (on digital displays and in print) over the past 6 months or so, and all that I could think of was that it spoke to me of the nearly universal pervasiveness of evil in our world today, and that I should take refuge in YHWH as never before. Do you also have any thoughts on what Leviathan might represent in our world? Thank you, and YHWH bless you. I am agent David White, and i'm a full member of the Illuminati. are you tired of poverty, hardship in life, do you want to be that successful man or woman you ever dreamed of, do you wanna leave poverty and come to light, this is the right time for you to make a different in your life and that of your family members, this is the time for you to join the BROTHERHOOD OF ILLUMINATI, where you will be giving the sum of 2 million dollars, a car, a house in any country of your choice, and ring of protection, and it's totally free for those living in the States. all you have to do is to email us via our official email, illuminatichurch001@gmail.com or via mobile number +1(508)644-0400. I am agent David White, and i'm a full member of the Illuminati. What shall it profit a man to gain the whole world and then lose his very own soul? Gal Potha stone book in Sri Lanka is 322" in length, or the square root of 720 when viewed in feet. As an amateur ancient metrologist I find its dimensions fascinating, a real stone book.